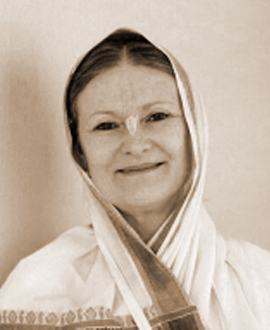 H.G Dina Sharana Devi Dasi joined ISKCON in Germany in 1974, and was initiated by Srila Prabhupada the same year at the Schloss Rettershof Castle temple, the headquarters of ISKCON Germany at the time. She served as a BBT book distributor and pujari at the Schloss for many years. After many years of selfless work towards building and strengthening projects within ISKCON Germany, Dina Sarana Devi Dasi was elected as a full member of ISKCON�s Governing Body Commission in 2010. She is only the second woman to accept the position of full-voting GBC member and her zonal assignments are in Germany, Austria, Switzerland and Lichtenstein.She has always led by example in her zone, and believes that female GBC members can bring positive advantages to ISKCON�s leadership. Her focus is on training and engaging qualified persons to assist in communications, succession, education and training, and she is committed to increasing BBT book distribution. Dina Sarana Devi Dasi�s primary goal as a GBC member is to do whatever she can to help ISKCON Germany�s present and future leaders reach their full potential.